St. Louis Fence Co. provides residential fence installation. We have been in the fence business for many years and have seen all the trends come and go. We know how to make your property look great and will work hand in hand with you to find just the right fence for your property. So whether you are looking for a simple chain link fence to keep the neighbors off your lawn, or a decorative wooden fence, St. Louis Fence Co. has the solution for you. Our technicians are highly trained at installing all kinds of fences. Call us today to speak with one of our represenatives and they can have someone out to your property in no time to do a full assessment of your fencing project. 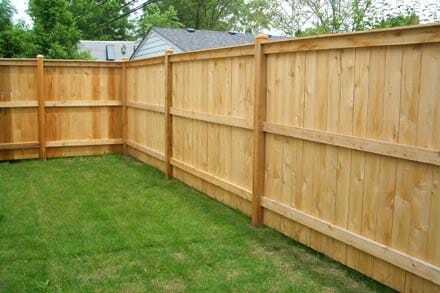 We will provide you with a fair estimate and discuss all the different fencing possibilities for your residence. A fence can drastically improve the look of your property and St. Louis Fence Co. takes pride in the beautification of your land. Is there a particular type of fence you are looking for? We have it! Call us today at 314-200-0529 or fill out the form on the right and tell us excatly what you want. We will bend over backwards to make your ideas a reality. We are fence installation experts.